AgroGeneration is an agricultural company which has concentrated c.a. 120,000 hectares of arable land in Ukraine since March 2007. Today, AgroGeneration is ranked amongst some of the largest agricultural firms in Ukraine both in terms of cultivated acreage and operational efficiency. The company’s core business is grains and oil commodity crop farming. Operations are fully provided with modern agricultural machinery and infrastructure. The company is run by a strong management team with a proven track record consisting of seasoned agricultural professionals and experienced professionals from the agricultural sector. AgroGeneration transforms the land it works and today outperforms Ukrainian average yields. The company follows a traditional crop rotation and puts money into first-class fertilizers, seeds, and agricultural chemicals for the purpose of achieving profitability per crop. 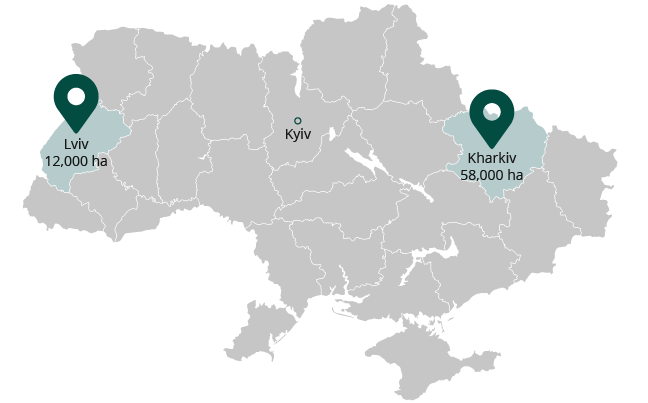 Operated farmlands of AgroGeneration are located in five regions of Ukraine – Kharkiv, Lviv, Sumy, Zhytomir and Ternopil, all of which represent good soil quality and a propitious climate for achieving high yields. AgroGeneration’s long-term strategy is to create value and generate attractive returns by consolidating land into efficient management structures and integrating storage and supply chain assets, and commercial activities for the purpose of further expansion both vertically and horizontally to achieve economies of scale and provide operational synergy. Operational focus is centered on implementing state-of-the-art agricultural technology and reducing costs, choosing profitable grains and oilseeds adapted to the specific regions of operation and improving yields to achieve sustainably high results. The Company establishes itself as a good base for further development and growth, with its large size, application of unique Western-management practices and skills, and good experience on the Ukrainian agricultural market.